The LS7708 scanner provides quick, accurate scanning, helping users save both time and money. Ideal for presentation and swipe scanning, the device combines the ease of hands-free with the versatility of hand-held scanning. Its intuitive design, large scanning window and flexible operation can make checkout faster and more efficient, freeing up employees to focus on customer service. Designed to stand up to the toughest and busiest environments, this scanner is a cost-effective solution for medium to high volume retailers. Maximises first-pass read rates and even reads truncated bar codes. Supports new, GS1 DataBar bar codes to future-proof your investment. Allows migration to other hosts with the switch of a cable. Saves money by using one cable across the Motorola product line. Improves first-pass read rate and increases productivity. 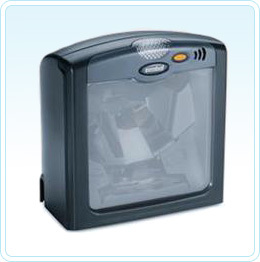 Eliminates the need to de-activate security tag in a separate step, saving time. Reduces total cost of ownership by enabling remote, network-based device management. Allows for easy programming and set up — ideal for large installations. Connects to secondary scanner for scanning heavy or oversized merchandise. Reduces power demand and increases life of the scanner. Scanner warranty 2 years (24 months) from date of shipment. See full guarantee for details. 1 Does not include cable. 2 Refers to 100% UPC bar code (80% contrast) located 4 in./10 cm. from the scanner nose. 3 Specifications are subject to change without notice. If your computer system can't supply enough power via USB or you are using RS-232 then use this power supply.